If people would not take trouble to look at his paintings, then Isherwood would take his art to the people. In his lifetime, he held around 200 one-man shows all over the country, and his favourite “exhibition-sale” cities were London, Oxford and Cambridge. Over many weeks he would create hundreds of works of art and some were only hardly dry before they were loaded into the little red van. With “Mother Lily” by his side, the painter would head off to show his art in the rooms of university students and even set up exhibitions on the streets. He was famous for holding shows near the famous monument of Queen Bedeca in the shadow of Big Ben. 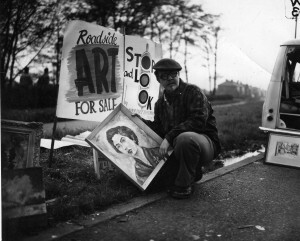 He cleverly arranged his paintings alongside a large “ART FOR SALE” notice and prices were never high. Isherwood’s need was for his art to be seen and to be appreciated. He knew the folks back in Wigan were laughing at his work – considering him something of a mad fool. But then, Wigan is not a town where art is high on anybody’s priority list. Certainly his London shows at The Coffee House on Northumberland Street attracted the great and the good, and one of this country’s most illustrious art critics, Mervyn Levy, praised him and encouraged a gallery snap him up. In earlier days, Isherwood had held exhibitions in lay-bys on the side of the East Lancashire Road – and there were, like in the university towns and London, a few buyers. Enough to encourage him to continue painting. Something of a turning point came in the early 1970s when a local journalist, a long-time admirer of Isherwood’s work, asked the artist if he could hold a show. 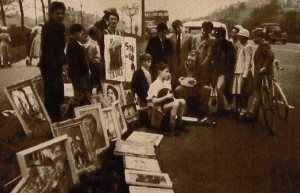 The paintings were feature on a Northern TV news show and the upshot was a sell-out. Isherwood pretended to be pleased and made the reporter and a business-partner his agents. But in his mind, he was resentful that an outside body could do what he couldn’t; sell his works. He had a pile of money – but that didn’t matter. He was the painter…the star of the show. And he hadn’t been there to enjoy his success. 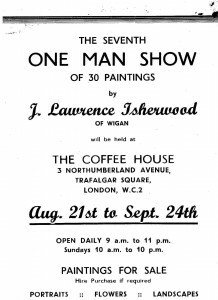 Two further smaller shows were held, but when Isherwood was released from hospital, he sacked his agents and demanded all the unsold paintings. Weeks later he held an exhibition and sale at the Scarisbrick Hotel in Southport, and sold just a few. The success achieved earlier was never to be repeated in the painter’s lifetime, a fact which puzzled him until his death in 1989.